Nexterday North 2016 was an as fantastic experience as the first, inaugural, anti-seminar in 2015. 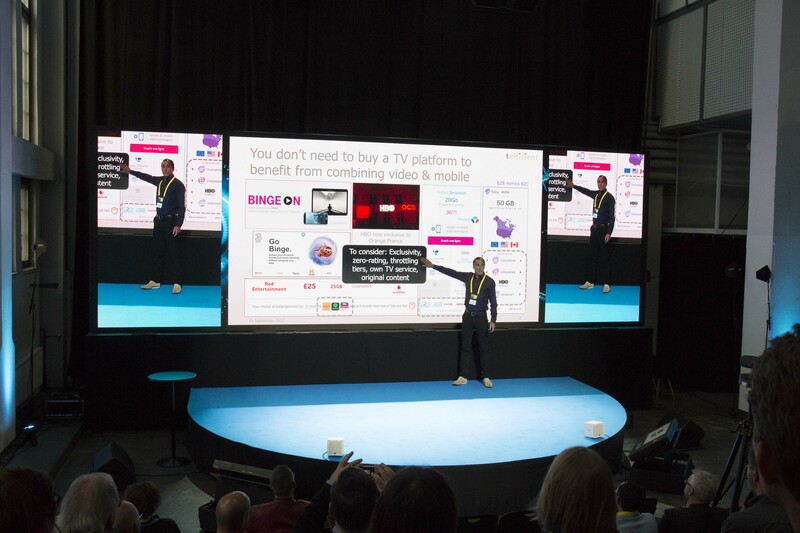 Once again, Comptel managed to bring 550 thinkers and doers from around the world to Helsinki and create great buzz around it. 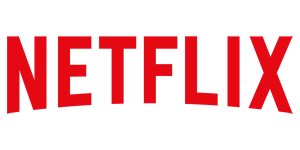 Some of you might feel that tefficient tends to overstate the importance of Netflix for telecoms. BT Sport: 450 MGBP spent this year. Does it pay off? Since last year, BT is on a route so far not tried by other telcos. 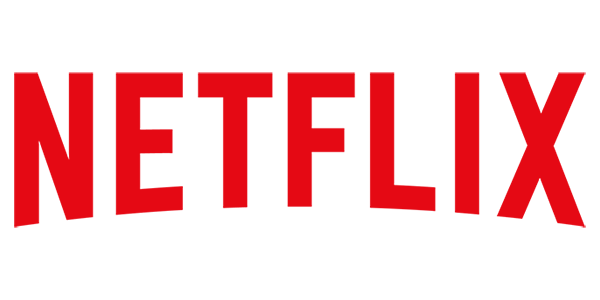 In August 2013, BT Sport was launched: A new TV channel which acquired the exclusive rights to show many of the Premier League football games in the UK. Previously, these rights were with satellite and TV provider Sky. If you want to see Premier League football, you need to become a customer of BT Sport. But that isn’t BT’s primary proposition: Instead, they want you to become a BT broadband customer – since then you get BT Sport included for free. BT uses the sports rights as a tool to strengthen their retail market share in fixed broadband and TV. And that’s an innovation. The graph shows how BT’s broadband net adds have developed: In a mature market, BT adds more broadband customers after the BT Sport launch than before. 6,8 million customers in June 2013 grew to 7,3 million in March 2014. But is comes with a high price: In its year to March 2014 report, BT says it spent 450 MGBP (or 3,6% of the total OPEX of BT Group) on BT Sport during the year. Programming rights were 203 MGBP of this. 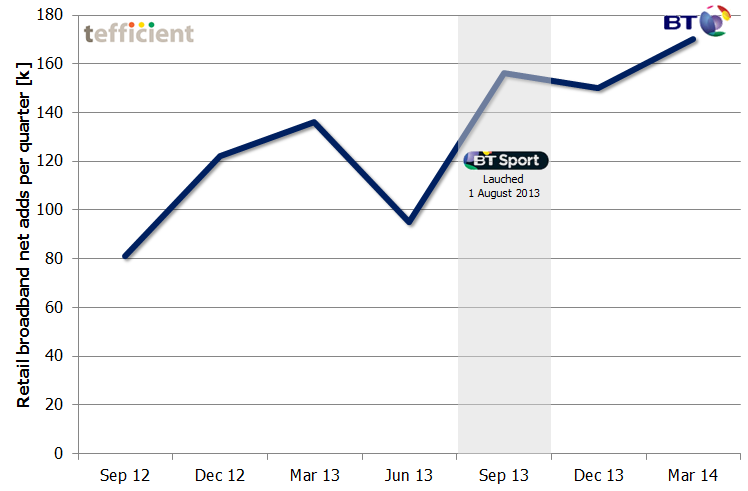 All this is OPEX; the BT Sport related CAPEX was spent last year. In March, BT had 3 million direct BT Sport customers. In total, BT Sport is in 5 million UK homes. The additional 2 million come via the wholesale agreements BT later have done with e.g. Virgin Media and Sky. Even though these agreements bring revenue to BT (BT Sport e.g. costs 12 GBP per month if you are a Sky customer), they work against the idea of using BT Sport as an acquisition and retention tool for BT broadband. Future will show if BT Sport became a game changer for BT. So far, it’s been a lot of money: Roughly 3000 GBP of OPEX per additional broadband net add since the BT Sport introduction. At tefficient, we’ve built a comprehensive before/after analysis framework of the results operators have achieved when transforming their offers from single-service to quad-play. 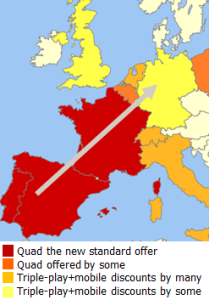 There are many indications that quad-play is about to become the new European standard: Telekom will go quad-play in Germany during 2014; Vodafone has acquired Kabel Deutschland and Ono to go beyond mobile-only; TeliaSonera reorganised 1 April to converge fixed and mobile on a national basis. 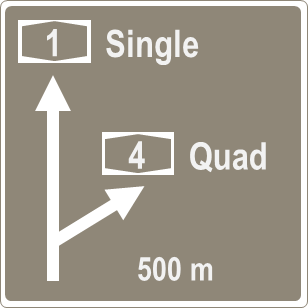 Quad is propagating over Europe with south-westerly winds. The map above shows the wind direction: From Portugal, Spain and France towards Central and North Europe. The first step towards true quad is often what we call light quad – a discount that a customer gets if he or she adds mobile to triple-play. In this case, it’s typically not very prominent in operator’s marketing, there’s typically no product brand name, and far from the straight-forward pitch of true quad operators. 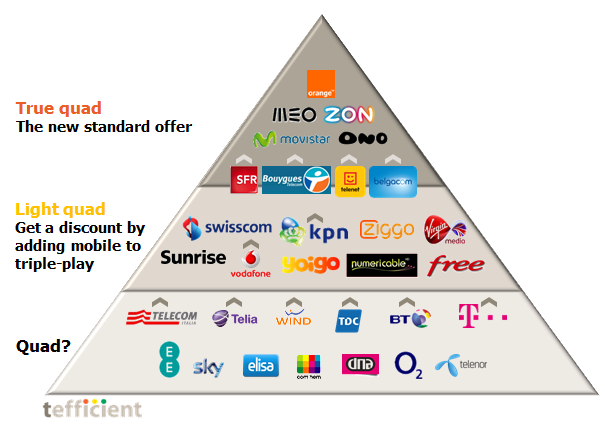 The current position of European operators – who have quad capability – is seen in our quad pyramid above. The arrows indicate operators that are seen to take action to move upwards. Through our before/after analysis, we’ve spotted several very interesting outcomes – best as well as worst practices. These can be used to either prepare your own journey into quad – or understand how to best defend against quad-capable competitors.